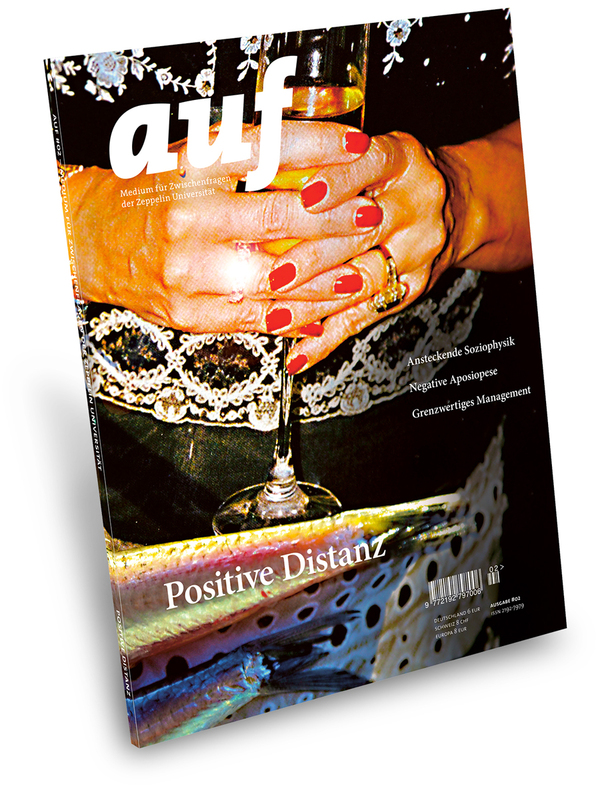 What is Ruediger John’s multi-perspective approach to ‟Positive Distance”? What can art do? Or to phrase the question more specifically: What additional information does the artist Ruediger John communicate with his photo spread on the multi-perspective consideration of “Positive Distance,” to which this issue of the magazine is dedicated. Ulrike Shepherd, curator of the artsprogram at the Zeppelin University, takes a close look at this photographic intervention, focusing specifically on the added value and insight provided by the artistic composition. At first glance, the photographs with their “high-gloss” messages from the realms of fashion and eros, wealth, and power, do not seem to send any unusual signals as far as the visual presentation of the magazine is concerned. One after the next, the featured images are appealing, glitzy and colorful, reminiscent of familiar stock and fashion photos. This is the second issue of the Zeppelin University’s magazine, and its design will immediately fulfill all the aesthetic expectations that readers might have of a fashion magazine. For a research magazine, however, the design is surprising. It is the topics that are addressed in the texts that force the readers to take a second glance, in which they will discover that the enticing advertising images have been displaced in a scholarly context, making this artistic contribution increasingly visible. It also becomes apparent that Ruediger John’s photographs are strategic appropriations from the world of media. The pictures of fashion photographs reveal their manipulations, transformations and reinterpretations with regard to their role as artistic commentary on the magazine’s featured topic. In reference to the article, it is possible to associate the CHANEL logo with CHANge; WIN in the image can be placed in relation to “distance management”; beauty products become Petri dishes; masks with lipstick kisses are reminiscent of the Guy Fawkes mask used by Anonymous; seducement becomes surveillance, and along with it the shot of the model becomes tastelessly voyeuristic. Shifts in meanings, accentuations, distortions in perspective and the drawing of attention all belong to Ruediger John’s artistic method and serve to make the motifs he finds laden with significance. He applies the aesthetics of advertising in his visual piece in a playful and ingenious manner – and adopts its seductive aspects with subtle irony and a sense for the grotesque. The subjects – idealized images portraying the longing for beauty in the form of stereotypical images of men and women from advertising, of luxury items and of exclusive surroundings – are re-shot from unconventional angles, with distorted perspectives and en plein air in natural lighting conditions. This alienating, fragmented, playful and ironic interpretation causes them to lose their original artificial staging. Ruediger John purposely zooms in on reflections in the high-gloss brochures, and in an act of proprietary appropriation, these light reflections and lens flares are integrated into the images as traces of technology. They also disclose and/or make obvious that the foreign images are quotes and draw attention to the photographic assertions made by the artist. Edges in the images, creases from turning the pages, imperfections on the image surface, scratches, rips and tears in the paper: the closeness of the camera to the subjects makes the reader aware of the materiality and media positioning of the images in the magazine. Heightened sensuality, the exaggeration of what was already exaggerated – down to the pores and pixels – goes from fashion to fishes and leaves the reader with mixed feelings. A reflective distance from these functional advertising images is created through photographic closeness. While looking cold and remote, these images originally aimed to seduce and appeal to the emotions. Now the subjective “eye” of the artist's camera pushes these deliberately created images of beauty into displaying all of their artificiality, demystifying the idealized world they depict. Exposing the staging by making the act of photographing visible disturbs the readers’ ability to look at the images with abandon – the image is perceived as an image and its power is broken. At one point, the images delve beneath the text; in another instance, they press into it; they become connected to the content or they distance themselves from it through free associations. The images cannot and do not wish to withdraw from the text, as both belong to the same context. However, their autonomous, “sensual” commentary and the connections between the photographs open up an additional visual semantic level. Ruediger John’s photographic exploration of the visual impact of images, their messages and subtexts, and the insights that are communicated photographically do not represent the content of the texts, but rather the autonomous information that images provide. It is in this way that Ruediger John’s aesthetic strategies raise awareness for modes of perception and prompt readers to consider the complex relationships between text and images, between research and the media. In addition to the visual artworks themselves, the very idea behind the magazine, too, can be viewed as an aesthetic exploration and experimental research object, where questions regarding communication, the processing of information and the striving for knowledge in the print medium and its intersection to non-print media are examined. The artist Ruediger John was invited to develop the original concept for the magazine, introducing his transdisciplinary mode of artistic work into it, along with the multi-perspective and critical approach with which he examines concrete situations and issues. It is significant that his concept served to break with the conventions that are so typical for these kinds of publications.